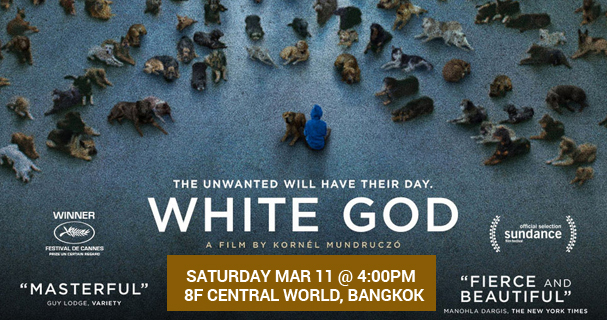 Catch the screening of award-winning Hungarian film entitled “White God” on Saturday, March 11, 2017 at 4pm as part of the Contemporary World Films series at the Thailand Knowledge Park, 8th Floor, Central World, Dazzle Zone. TK Park in cooperation with the Embassy of Hungary in Bangkok will present a film awarded as Un Certain Regard winner at the prestigious Cannes Festival and an entry for the 2014 Oscars. The movie dubbed by the New York Times “A fierce and beautiful parable”, “White God” was directed by Kornél Mundruczó. “White God”, is set in the captivating Hungarian city of Budapest, is a striking and lovable story of the love between Lili, a 13-year old girl, and Hagen, a half-breed street dog. The teenage girl brings Hagen to live with her and her father, but the father refuses to keep him and abandons the dog on the streets. Being a street dog, Hagen is challenged to survive and is caught to become a dog fighter. Will the love of Lili and Hagen be rekindled once they meet again? Will human emotions awaken the longingness of Hagen where he was taught to fight and kill? A film entitled “Fair Play” opened the series of films to be screened at the TK Park. Compared to the opening film, “Fair Play”, “White God” posts questions about injustice, not only between humans and animals, but also between different races, religions and social status. The movie depicts what it takes to live in a society full of differences towards each other. His Excellency Dr Peter Jakab, Hungarian Ambassador, will be joining the screening to introduce the film more. Ticket price is at 20 Baht for the One-Day Pass. The venue will be open at 3:00pm. For reservations and ticket inquiries, you may email yuttinai@tkpark.or.th, or call TK Park at 02-257-4300.